I could have trashed this up by letting my emotional dislike for Ayn Rand takeover. Instead I put together a small sprinkling of notes to describe Ayn Rand. There’s much more that can and has been said about this woman, just as there’s books on Charles Manson, Ted Bundy and other psychotics. A little research goes a long way. 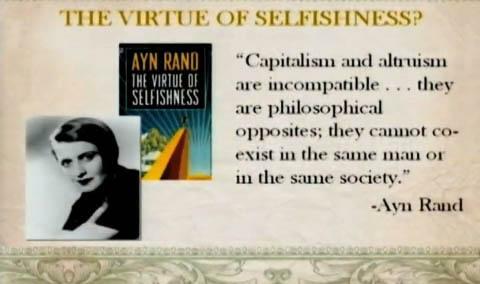 Ayn Rand fans have a terrible grasp on the real Ayn Rand, or they themselves suffer from the same sickness as Rand. That’s cool, even Charles Manson has fans. Why is Rand’s philosophy bad for mankind? Conservatives keep claiming liberals want a “cradle-to-grave nanny state.” That rhetoric has distracted us from the real social re-engineering taking place all around us. The right, along with its “centrist” collaborators, is transforming our nation into a bloodless and soulless Randian State. The Simpsons made a running joke out of Springfield’s ” Ayn Rand School for Tots,” where toddlers fend for themselves in playrooms whose signs say things like “Helping is Futile.” That’s very funny. What is happening to our country isn’t. The Randian State is built in the morally depraved mold of right-wing über-heroine Rand, who reviled the less fortunate – and even those who tried to help them – as ” parasites,” while at the same time idolizing sociopathic killers. The Randian State’s first manifesto may have been the startling document produced by Ronald Reagan’s “blue ribbon” education commission in 1983, which proposed to use schools as factories for more effectively turning Millennials – and every generation that follows – into usable raw material for corporate production. Remember Margaret Thatcher’s remark, “There is no such thing as society, only individuals”? That’s the sociopathic mindset in a nutshell. Of course, Thatcher added, “and their families,” an obligatory conservative feel-good trope. But as Hanauer told Chris Hayes, “These are the people who did not go to their kid’s soccer games.” In short, Thatcher was lying when she tacked on “families.” Sociopaths are like that — they lie a lot. A psychosis is a major mental disorder. A psychopathic personality shows not a disorder of personality but rather a defect of personality, together with a set of defenses evolved around that defect. The defect relates to the most central element of the human personality: its social nature. The psychopath is simply a basically asocial or antisocial individual who has never achieved the developed nature of homo domesticus. For those who haven’t had the great misfortune of reading “Atlas Shrugged,” the book is premised on the idea that if the world’s “creative leaders,” businessmen, innovators, artists (i.e., the “makers”) went on strike, our entire society would collapse. These strikers hide out in a utopian compound in the mountains of Colorado while the rest of us despondently wail and gnash our teeth and beg for them to once again bestow their creativity upon us. The appeal of the Randian vision to today’s wealthy is obvious: it puts them back at the center of economic life. They long ago realized that rather than being the beneficent “makers” they had always imagined themselves to be, they were the parasitical “takers” they so despised. Their wealth, which was once a symbol that God praised their work, became an instrument for social change (Carnegie, Rockefeller) and eventually good in itself (Gates, Jobs). Social Darwinism, the idea that the economy is a “survival of the fittest” competition where the superior end up on top, exults the businessman as superior and deserving. But as Henry George noted of Herbert Spencer (the founder of Social Darwinism): “Mr. Spencer is like one who might insist that each should swim for himself in crossing a river, ignoring the fact that some had been artificially provided with corks and other artificially loaded with lead.” F. Scott Fitzgerald and Thorstein Veblen ridiculed the idea that the wealthy were in any way superior. Social Darwinism has resurged in conservative thought, supplementing the Randian vision to fortify a social order in which a minuscule proportion of society reaps its rewards. Because the wealthy are no longer willing to use their wealth for good, they have decided to glorify the wealth itself as good. The growing influence on the American right of Ayn Rand, the libertarian right’s answer to Scientology’s novelist-philosopher L. Ron Hubbard, is a wonder to behold. When she died in 1982, Alissa Rosenbaum — the original name of the Russian-born novelist — was the leader of a marginal cult, the Objectivists, who had long been cast out of the mainstream American right. But the rise of Tea Party conservatism, fueled by white racial panic and zero-sum distributional conflicts in the Great Recession, has turned this minor, once-forgotten figure into an icon for a new generation of nerds who imagine themselves Nietzschean Ubermenschen oppressed by the totalitarian tyranny of the post office and the Social Security administration. She has a great attraction for simple people who are puzzled by organized society, who object to paying taxes, who dislike the ‘welfare’ state, who feel guilt at the thought of the suffering of others but who would like to harden their hearts. For them, she has an enticing prescription: altruism is the root of all evil, self-interest is the only good, and if you’re dumb or incompetent that’s your lookout. Ayn Rand and her “Objectivist” cult members never forgave Buckley for reading them out of the mainstream American right, along with the equally crackpot John Birch Society. In 1957 Buckley, then the young editor of the flagship magazine of the conservative movement, National Review, published a review of “Atlas Shrugged” by Whittaker Chambers, the ex-communist intellectual who had played a key role in exposing Alger Hiss as a Soviet spy. The Children of Light are largely operatic caricatures. In so far as any of them suggests anything known to the business community, they resemble the occasional curmudgeon millionaire, tales about whose outrageously crude and shrewd eccentricities sometimes provide the lighter moments in Board rooms. Otherwise, the Children of Light are geniuses. One of them is named (the only smile you see will be your own): Francisco Domingo Carlos Andres Sebastian d’Anconia. In Atlas Shrugged, all this debased inhuman riffraff is lumped as “looters.” This is a fairly inspired epithet. It enables the author to skewer on one invective word everything and everybody that she fears and hates. This spares her the plaguey business of performing one service that her fiction might have performed, namely: that of examining in human depth how so feeble a lot came to exist at all, let alone be powerful enough to be worth hating and fearing. Instead, she bundles them into one undifferentiated damnation. Miss Rand acknowledges a grudging debt to one, and only one, earlier philosopher: Aristotle. I submit that she is indebted, and much more heavily, to Nietzsche. Just as her operatic businessmen are, in fact, Nietzschean supermen, so her ulcerous leftists are Nietzsche’s “last men,” both deformed in a way to sicken the fastidious recluse of Sils Maria. And much else comes, consciously or not, from the same source. One Big Brother is, of course, a socializing elite (as we know, several cut-rate brands are on the shelves). Miss Rand, as the enemy of any socializing force, calls in a Big Brother of her own contriving to do battle with the other. In the name of free enterprise, therefore, she plumps for a technocratic elite (I find no more inclusive word than technocratic to bracket the industrial-financial-engineering caste she seems to have in mind). Chambers did not live to see one of Ayn Rand’s early disciples, Alan Greenspan, become chairman of the Federal Reserve, the ultimate technocrat of the financial caste, if not of industrialists and engineers. In addition, the mind which finds this tone natural to it shares other characteristics of its type. 1) It consistently mistakes raw force for strength, and the rawer the force, the more reverent the posture of the mind before it. 2) It supposes itself to be the bringer of a final revelation. Therefore, resistance to the Message cannot be tolerated because disagreement can never be merely honest, prudent, or just humanly fallible. Dissent from revelation so final (because, the author would say, so reasonable) can only be willfully wicked. Ayn Rand’s ‘philosophy’ is nearly perfect in its immorality, which makes the size of her audience all the more ominous and symptomatic as we enter a curious new phase in our society. Moral values are in flux. The muddy depths are being stirred by new monsters and witches from the deep. Trolls walk the American night. Caesars are stirring in the Forum. There are storm warnings ahead.